A while back I read a post at Zombie Chimp about a post they’d read on another blog. I thought it was pretty interesting so I decided to check out what search terms had brought people to this blog. I was hoping for some scandalously interesting terms like Chimp had, but I seem to just get serious WoW terms from people who are endlessly stuck in Uldum, (I hope I helped) or want to know how to get the Reins of the Phosphorescent Stone Drake. Here’s a small sample. For a few of these I’m pretty sure I was of some help. But wait … what? What are restraint boots? Hey, that sounds like it might be scandalously interesting doesn’t it. Okay, I just googled that and I’m not including the link. You can google it if you want. Sheesh, no wonder they were sent here, my post about The Boots of Canine Restraint was the third link. I am confident that I was of no help at all to them, lol. Occasionally I’ll see search terms and I feel bad, I dropped the ball. I knew what they wanted to know but it wasn’t in the post. Hey, wait! Come back, I know that! I guess if I required an email address I could email them the answer. Oh well. Oh, and yes, how the heck do you find Deathwing. If you find that out I wish you’d let me know. Die Hard Leveling sounds like a possibility, I might try that but it would kill me (well yeah, but I mean irl) to get in the 70s or so and fall off a cliff or Life Tap myself to death, both of which I have done … times too numerous to mention. I thought of another possible challenge, I don’t know if it’s been done or whether it would indeed be challenging but it’s interesting. My warlock WoW Ironman Challenger has done as well as she has for one reason. Her voidwalker pet, Mak. 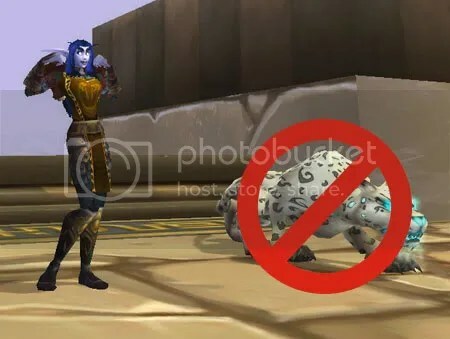 I wonder what it would be like to level a pet class like hunter or warlock without using a pet, ever. They could spec, use performance enhancing drugs, whatever. Just no pet. I asked my Hunter what she thought and of course she was confident a Hunter could do it. She said she could do it in spirit gear, no problem. Um, what, why does she even have spirit gear, I hope she didn’t roll on … oh whatever. Don’t tell her I said this but I’d take that with a grain of salt, I mean she is a Hunter … ah … you know how they are. 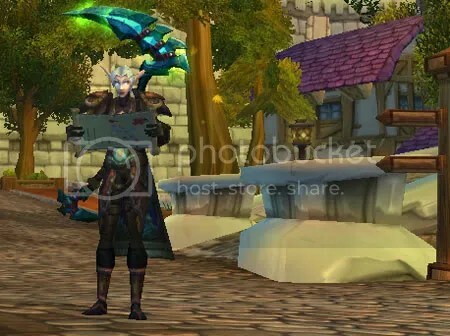 This entry was posted on October 5, 2011 at 12:03 pm and is filed under General WoW with tags Alts, World of Warcraft, wow, WoW Challenges, wow solo. You can follow any responses to this entry through the RSS 2.0 feed. You can leave a response, or trackback from your own site. I’ve collected the wierd search terms I’ve been getting over the years, seriously, I get the wierdest stuff, but I also get “where to get stood in the fire” or people trying to find maps of where to go to get that achievement. My blog title contains that line “stood in the fire” but no where can you find much information about getting that achievement. I’m sure some people close my tab feeling good old fashioned cheated “If she stood in the fire and even named her blog this, why can’t she tell me how to stand in it too?”. This somehow amuses me. Oh and your hunter(/warlock) challenge sounds cool. I say go for it! Oh I never thought of that, lol! I only wish there was a proven method to get Stood in the Fire. Maybe some day. I think I might try it. I don’t know if it would be a challenge but I could see. I think I’d do a hunter, I have a bazillion warlocks all over the place but only one hunter. Oh no! It was Vanilla when I leveled my hunter, I forgot they have an insta-pet now. Could I get it killed and not call it back? Hmm, have to look into that. Yes, I might be turning into an alternative leveler! My top searches are all about finding Phosphorescent Stone Drake. I think mounts and pets are the most popular. I’ll have to look on your blog, I don’t know where to buy the Goblin Mount either!